Dr. Jay H. Schwartz is a chiropractic neurologist, who has been in practice for over 32 years in Pomona, NY and more recently in Bradenton, FL. The combination of experience and remaining current with the latest procedures and techniques have contributed to the excellent results Dr. Schwartz gets with a variety of problems, particularly herniated, bulging and degenerated discs in the neck and lower back. He is certified* in both Cox Cervical and Lumbar Distraction, chiropractic procedures that requires the use of specialized equipment and treats neck and arm pain as well as lower back and leg pain caused by disc and joint problems. In addition to Cox Distraction, Dr. Schwartz also provides VAX-D treatment, a procedure that was invented by a physician, Allan Dyer, MD and utilized in the US and Canada. VAX-D has a documented 71% success rate (please see research page) with herniated, bulging and degenerated discs in the lower back. Dr. Schwartz is one of the few VAX-D providers who was personally trained by Dr. Dyer and is one of the most experienced providers of VAX-D in the country. VAX-D has enhanced his practice so that Dr. Schwartz now provides a more comprehensive approach to a variety of spinal problems. Dr. Schwartz is also one of the few chiropractors in the entire US who is board certified in Electrodiagnosis. Specifically, he is well trained in performing electromyography and nerve conduction studies, which are utilized to assess the integrity of the spinal and peripheral nerves. These tests are commonly performed by neurologists, however by having the ability to perform they himself, makes it much easier for patients since they do not have the hassles and anxiety of having to be referred out to other doctors. 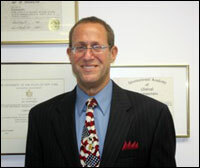 As you can see by all of the certifications*, Dr. Schwartz, is well trained in a variety of areas. He is also certified in the diagnosis of Whiplash injuries from the San Diego Spine Institute*. Dr. Schwartz recently took a position as an adjunct professor teaching Anatomy and Physiology at State College of Florida. This is his entry into the world of academia to satisfy his long passion to teach and give back to the community. He incorporates healthy lifestyles into his teaching in order to have an good positive influence on the youth as they are becoming young adults. Hopefully these concepts will be passed on to the next generation. Although chronic spinal problems are a major focus of his practice, Dr. Schwartz is very much involved with Health and Prevention. He frequently holds workshops on various health related issues and prevention of health problems as we age. His philosophy centers on the importance of good bodily function. In other words, doing as much as one humanly can to permit his body to work at its maximum capacity. Dr. Schwartz teaches his patients how to live longer and healthier through proper daily exercise, the best nutrition, the importance of a nervous system that functions at 100%, mental re-programming, and the elimination of chemicals from our immediate environment. These aspects of health are extremely overlooked. He doesn’t just give generalities, but gives his patients specific action steps to take in order to become healthy. Dr. Schwartz does not have magazines, such as People and Good Housekeeping in his office. Health related books, magazines and his own personal newsletters are found throughout the office in order to provide patients with the information, latest research and relevant issues regarding their health. The old expression, “give a man a fish, he has food for a day; teach him to fish and he has food for a lifetime!” applies to health as well. Dr. Schwartz is on a mission to change his patients’ lives by introducing them to the true meaning of health. Improving the health of our planet, one patient at a time! *“The specialty recognition identified herein has been received from a private organization (Cox Technic) not affiliated with or recognized by the Florida Board of Chiropractic Medicine”.